two easy and tasty recipes of gulab jamun are shared in this post. both the gulab jamun recipes are detailed with step by step pics. the first delicious gulab jamun recipe is made with khoya (mawa) and the second tasty gulab jamun recipe is made with milk powder. gulab jamun recipe with step by step photos. there are mainly two ways gulab jamun is made and this post details both the methods. both the gulab jamun recipes are easy and even beginners can make these tried and tested delicious melt in the mouth gulab jamun. you can choose the method depending on the ingredients available in your kitchen. what is gulab jamun ? gulab jamun is a popular indian sweet made from milk solids traditionally. khoya or mawa is the hindi term for evaporated milk solids. the word “gulab jamun” means rose berries. in hindi language, the word “gulab” means rose and “jamun” is a darkish purple berry (java plum, black plum) available in india. 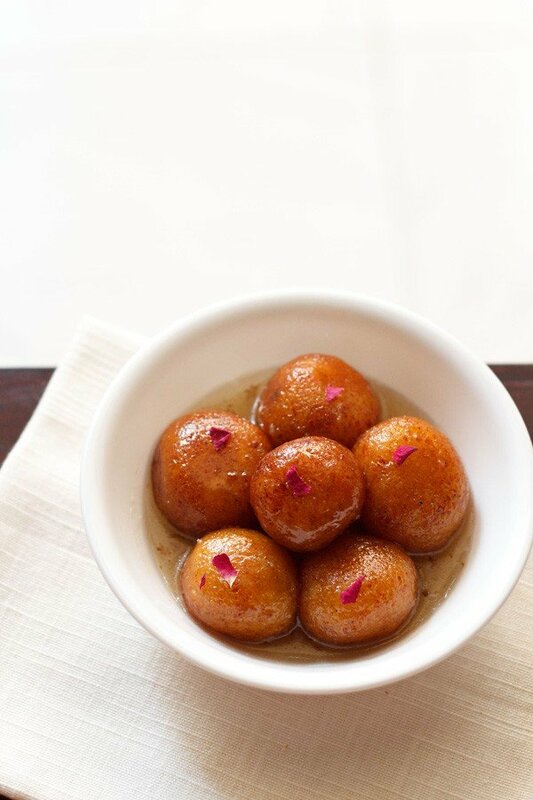 the sugar syrup made for gulab jamun is flavoured with rose water and the fried dough balls have a size similar to jamun berries – hence the term gulab jamun. gulab jamun is a favorite indian dessert for many folks. 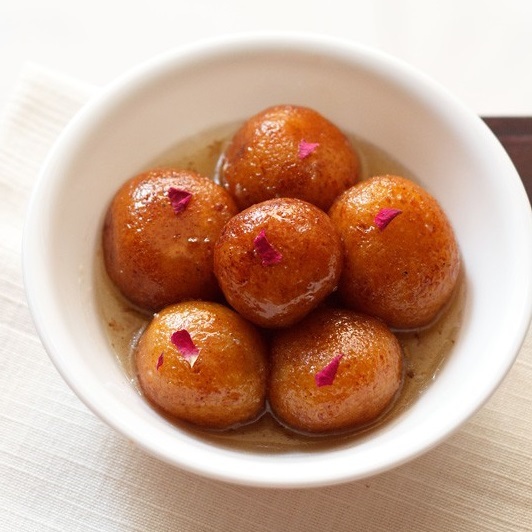 in parties, weddings and even in indian thalis, gulab jamun happens to be one of the desserts served after the meals. these soft sugar syrup soaked balls are a treat always. sometimes to satisfy our sweet cravings, i make gulab jamun. gulab jamun is made with mawa or khoya, milk powder, sweet potatoes (vegan option), paneer, potatoes and bread. however, the best authentic taste comes from gulab jamun made with khoya. this recipe post has two variations of gulab jamun. 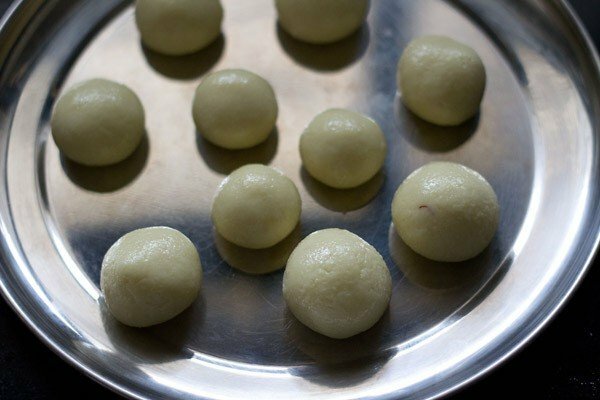 the first gulab jamun recipe is made with khoya and the second recipe is made with milk powder. below i have mentioned both the recipes methods. 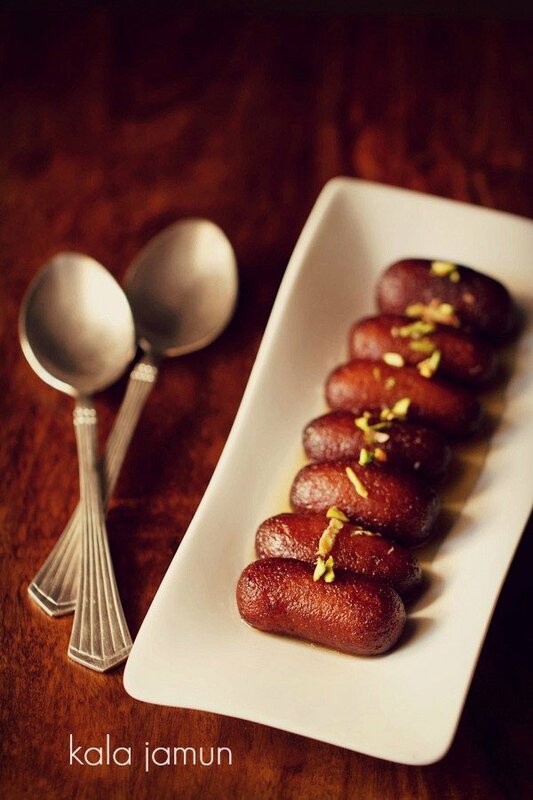 authentically and traditionally gulab jamun is always made with khoya or mawa. khoya is basically dried evaporated milk solids – which is obtained by continuously cooking the milk on a low flame. you can either make khoya at home or get it from the market. just remember that for making the traditional version of gulab jamun – chikna khoya or dhaap khoya is used. in hindi the name “chikna” means smooth. so thus dhaap ka khoya is a smooth and soft khoya. 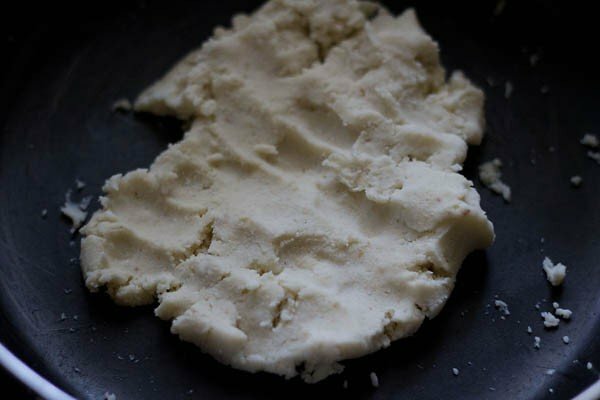 chikna khoya can be easily made at home. it has more moisture than the other two varieties of khoya viz danedar khoya and batti khoya. this gulab jamun recipe i have shared is an easy one that yields delicious, soft and tasty gulab jamun. this gulab jamun recipe from my home science notes is tried, tested and has never failed. i have made this gulab jamun recipe many times. you will need khoya (mawa or dried evaporated milk solids) and paneer to make the jamun. addition of these two ingredients makes soft, melt in mouth and best gulab jamun. the gulab jamun recipe made with milk powder is a cheat’s version but tastes equally good. this milk powder gulab jamun recipe comes handy if you don’t have khoya or paneer readily available at home. 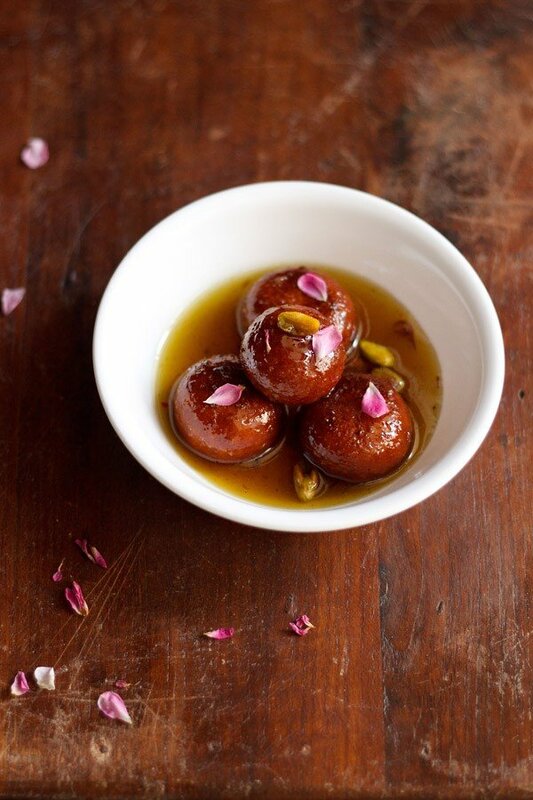 all you need is milk powder, curd, sugar and water to make a tasty gulab jamun at home. this version of gulab jamun made with milk powder is soft, melt in the mouth and taste delicious with a milky taste. i have compiled the below pointers of frequently asked questions based on queries received from the readers in the comments section of this gulab jamun recipe post. why gulab jamun break on frying ? if there is too much moisture in the dough, the jamun will break in oil. more baking powder can also result in the jamun breaking and disintegrating in oil. when frying the temperature should not be too high or too low. 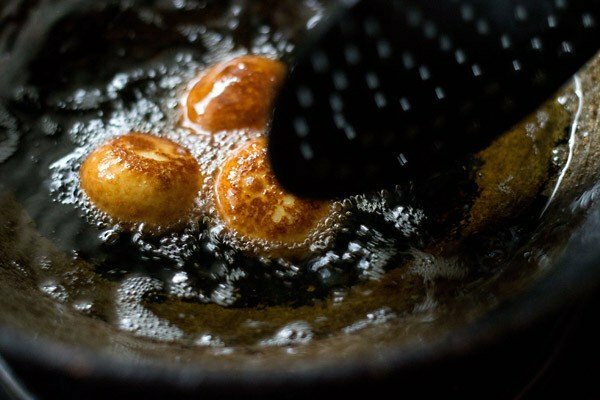 a higher or a too low temperature of oil while frying can also break or crack the gulab jamun. if the binding ingredients like maida or rava (sooji) are less, then this can also break jamun when frying. as soon as you add the gulab jamun balls in the oil, then let them become slightly crisp and then only turn them. when making jamun dough ball, there should be no cracks on it. if you see cracks then add some more milk in the dough mixture. mix and then form the jamun again. why has gulab jamun become hard ? if there is less moisture in the jamun, it may become hard. the gulab jamun dough has to be mixed and not kneaded. if the dough is kneaded then the gulab jamun will become hard. when you knead the dough, gluten strands will form which will make the jamun dense and heavy. even if they are slightly dense they won’t absorb the syrup and thus remain hard. 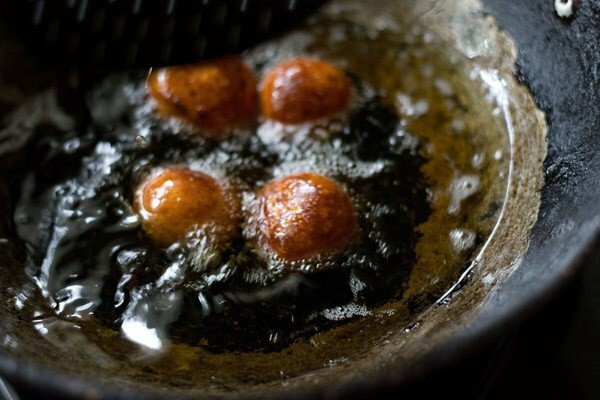 in fact when frying gulab jamun, it should feel like very light spongy balls. you will feel the lightness in them. for the gulab jamun made with milk powder, it is important to get the right texture in the gulab jamun dough. if you get it right, then making this gulab jamun with milk powder is a cakewalk and you won’t feel like buying them from outside. i have mentioned all the tips and suggestions in the steps which can become a bit tricky, if not rightly done. so please take your time to read each step carefully. why gulab jamun has become too soft ? the sugar syrup for gulab jamun should have a sticky consistency. they should not have a watery consistency. if the sugar syrup is watery, then the jamun absorbs more sugar syrup resulting in it being super soft and can even break in the sugar syrup. first the oil has to be heated till its medium hot. then reduce flame to a medium-low or low and wait for a minute. then gently place the gulab jamun dough balls in the oil. 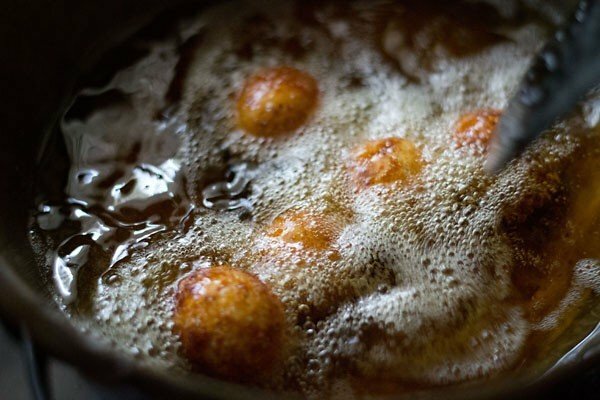 once the jamun dough balls start to have tiny light golden spots on them, then keep on rotating them with a slotted spoon in the oil often. this way the gulab jamun will have an even golden color. also do note that if the oil is on the cooler side, then the jamun will absorb more oil and can crack or break too. if the oil is very hot, then the gulab jamun will get browned quickly with the inside portion being uncooked and raw. 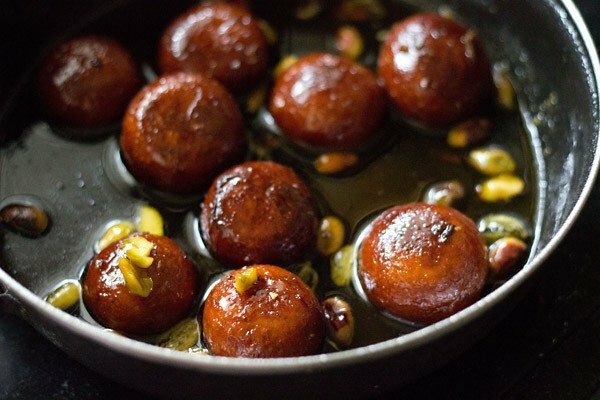 traditionally gulab jamun are fried in ghee. you can go the traditional way if you want or just fry them in oil as i have done. take khoya (mawa or evaporated milk) in a bowl. mash it very well. there should be no lumps. you can also grate and then mash the khoya. then add grated paneer, rava (sooji), all purpose flour (maida), baking powder and cardamom powder to the mashed khoya. there should be no lumps in both the mawa and paneer. as if they are there, then you will find the texture of the gulab jamun not so good. the bits and pieces of mava or paneer will give a bite in the mouth, when you have the gulab jamun. they won't be smooth. mix well. add milk and gather together to form a dough with milk. don't knead. just gently mix. if you are unable to form balls or if the mixture appears dry, then add a few teaspoons of milk. cover the dough and keep aside for 30 mins. make small balls from the dough. cover the balls and keep aside. dissolve sugar in water. heat the sugar solution till it become sticky. you just need to switch off the fire before the syrup reaches a one thread consistency. add rose water and stir. keep the sugar solution aside. on cooling if the sugar syrup crystallizes, then just add 2 to 3 tbsp water and warm the syrup again. it will again return to a liquid state. meanwhile, while the sugar syrup is cooking, heat oil till its medium hot. lower the flame and wait for a minute. then gently place the gulab jamun in the oil. 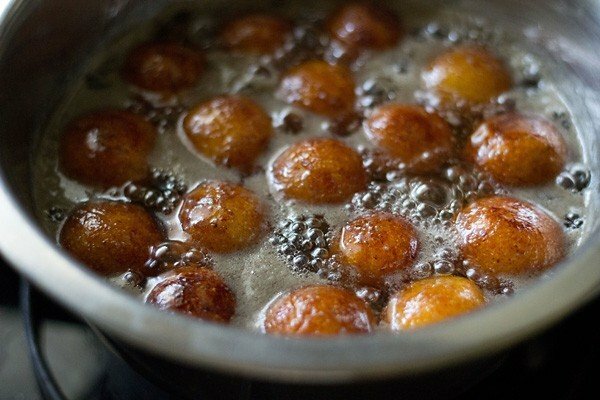 once they start to have tiny golden spots, keep on rotating them in the oil, so that the gulab jamun are evenly browned. remove the gulab jamun and then drain them on kitchen paper towels to remove excess oil. then place the hot gulab jamun in the sugar syrup. continue frying the gulab jamun this way in batches. when all the gulab jamun are placed in the sugar syrup, then keep the whole pan with the sugar syrup and gulab jamun, on a low flame for 1 to 2 minutes till the jamun become soft. heating helps the gulab jamun to absorb the syrup and become soft. the jamun increase a bit in size. don't overcook as then the jamun can break. use a large pan, so that the gulab jamun are not overcrowded and you can easily stir them gently while they are simmering. serve gulab jamun warm or at room temperature. you can also chill the gulab jamun and serve them cold. garnish the gulab jamun with rose petals or almond slivers. 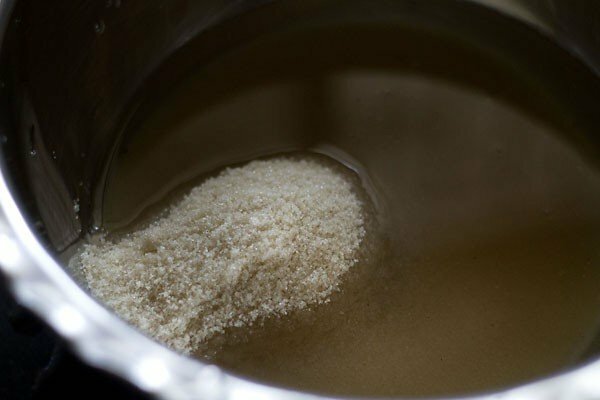 1. if the sugar syrup has impurities, then add milk and simmer. a layer of scum will be formed. remove this layer with a spoon. 1. take 1 cup khoya or mawa (200 grams) in a bowl. soft khoya also known as ‘daap ka khoya’ or ‘chikna khoya’ is used for making gulab jamun. 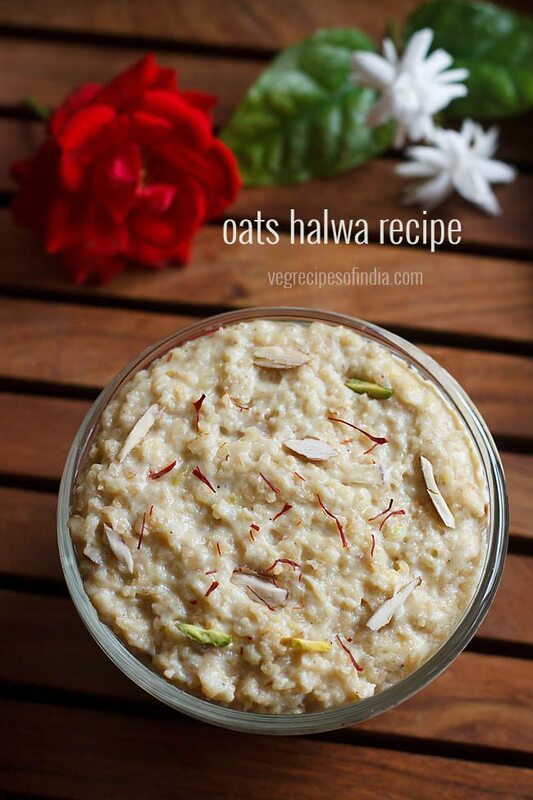 this is a soft khoya, so it mashes and kneads very well. 2. mash it very well. there should be no lumps or small bits or pieces in the khoya. you can also grate and then mash the khoya. do not mash too much. just mash and proceed with the next step. 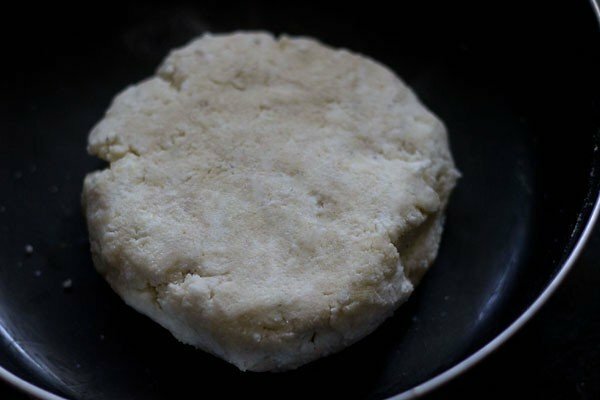 3. then add ¾ cup or 100 grams grated paneer, fine rava (sooji), 2 tablespoons all-purpose flour (maida), ¼ teaspoon baking powder and ½ teaspoon cardamom powder to the mashed khoya. there should be no lumps in both the mawa and paneer. if there are lumps, then the texture of the gulab jamun is not even and smooth. the bits and pieces of mawa or paneer give a bite while eating the gulab jamun. 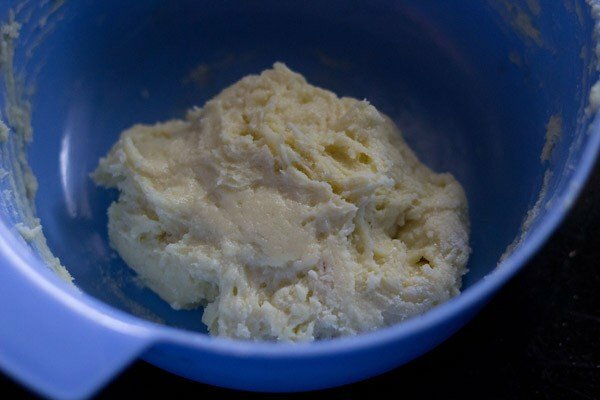 5. add 1 tablespoon milk and gather together to form a dough with milk. don’t knead. just gently mix. 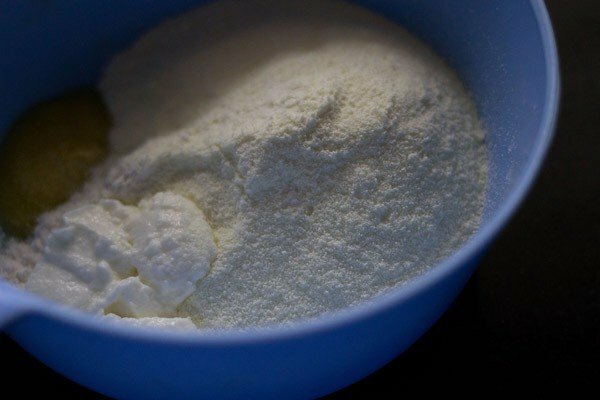 if you are unable to form balls or if the mixture appears dry, then add a few teaspoons of milk and mix again. cover the dough and keep aside for 30 minutes. 6. mix 1.75 cups (250 grams) sugar in 1 cup water. 7. on a medium-low flame, heat the sugar solution till it becomes sticky. you just need to switch off the fire before the syrup reaches a one thread consistency. the syrup should be sticky and not watery. you can even cook the sugar syrup till it reaches a half-string consistency. 8. add rose water and stir. keep the sugar solution aside. 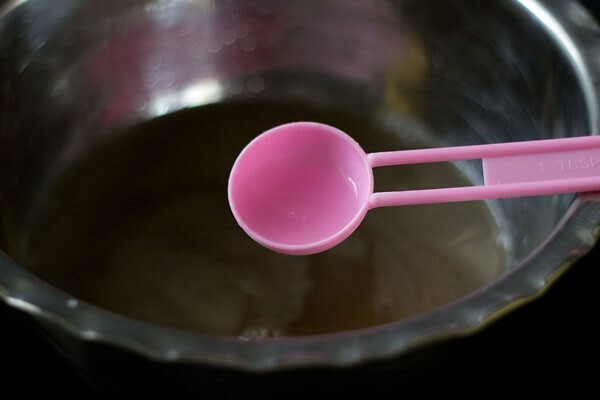 on cooling, if the sugar syrup crystallizes, then just add 2 to 3 tablespoons water and warm the syrup again. stir while warming the syrup. the sugar crystals will disappear. 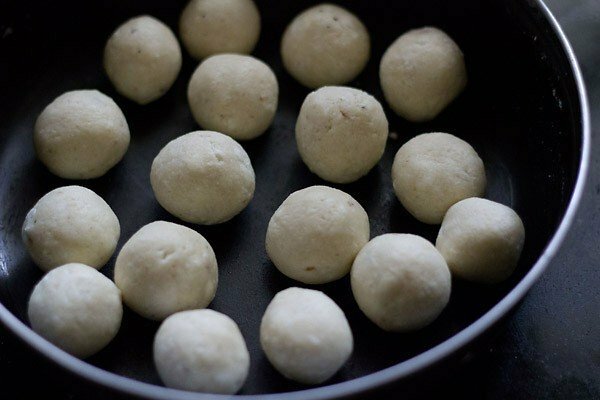 9. make small balls from the dough without cracks. cover the gulab jamun balls and keep aside. 10. heat oil until it is medium hot. lower the flame to a medium-low or low and wait for a minute. then gently place the gulab jamun balls in the oil. if in case, the gulab jamun is breaking while being fried, then add some more maida (about 1 to 2 tablespoons) in it. mix gently again. keep aside for fifteen minutes. then later fry. you can also check one small piece before frying the rest. if it breaks, then use the tip mentioned above. 11. once they start to have tiny golden spots, keep on rotating them in the oil, so that the jamun are evenly browned. since i was taking pics, i browned a few of them more. 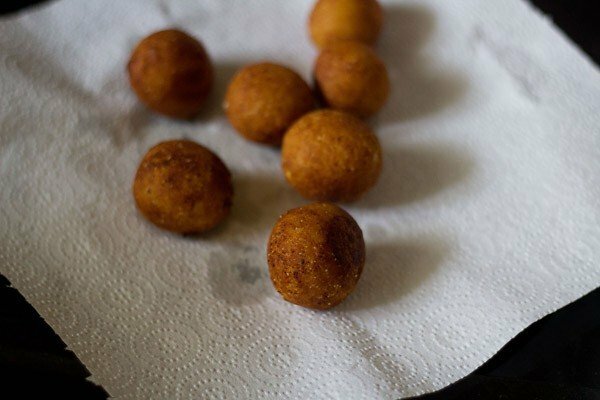 12. remove the fried gulab jamun balls and then drain them on kitchen paper towels to remove extra oil. 13. then place the hot gulab jamun in the sugar syrup. then continue frying the gulab jamun this way in batches. 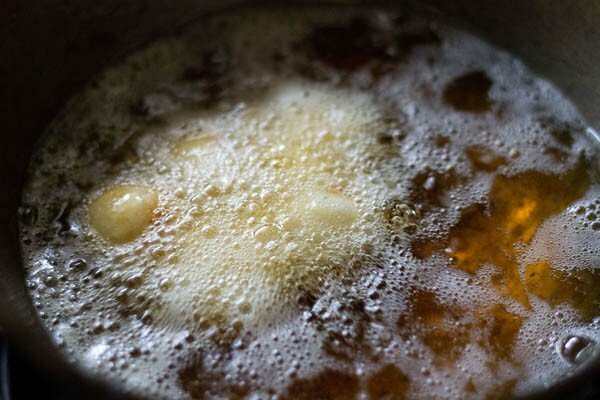 14. when all the gulab jamun are placed in the sugar syrup, then keep the whole pan on a low flame for 1 to 2 minutes, till the gulab jamun become soft. heating helps the jamun to absorb the syrup and become soft. the gulab jamun increase a bit in size. don’t overcook as then the gulab jamun can break. use a large pan, so that the fried jamun balls are not overcrowded and you can easily stir them gently while they are simmering. 15. serve gulab jamun warm or at room temperature. 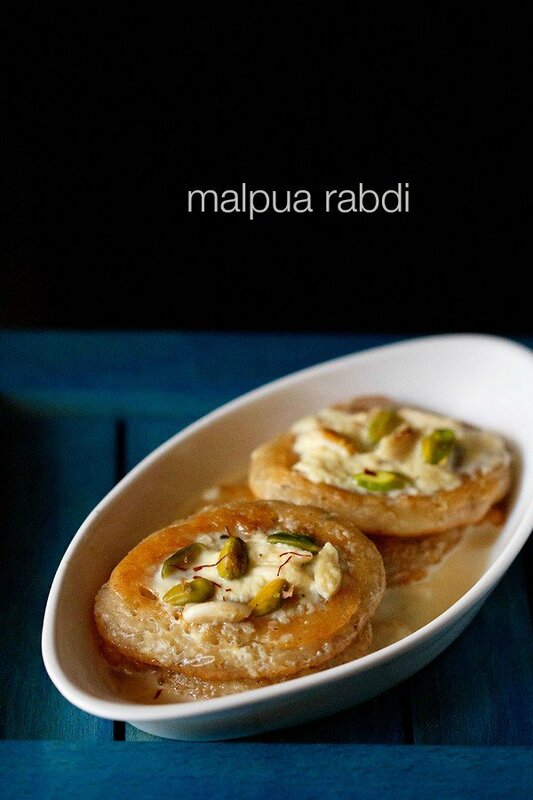 you can also chill the gulab jamun and serve them cold. garnish the gulab jamun with rose petals or almond slivers. 1. first stir the sugar, water, cardamom powder and saffron in a pan and keep it on fire. i have kept the cardamoms peels and these can be discarded when serving the gulab jamun. 2. gently bring to a boil and continue to stir occasionally. 3. add some pistachios in the syrup. an optional step but tastes good. make a thick syrup and switch off the fire much before the sugar solution reaches a one thread consistency. you can cook the sugar syrup till it reaches a half string consistency. 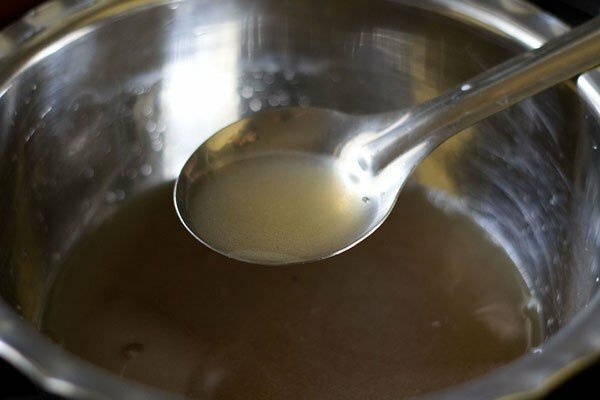 on cooling, if the sugar syrup crystallizes, then just add 2 to 3 tablespoons water and warm the syrup again. it will again return to a liquid state. 4. mix the 1 cup milk powder, ¼ cup all-purpose flour or maida, a pinch of baking soda, a pinch of salt (optional) in a mixing bowl. 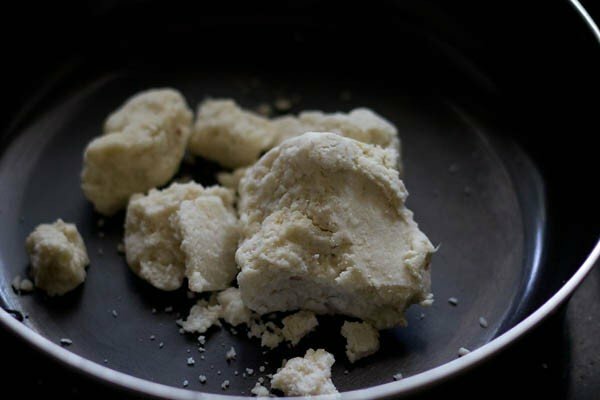 add 1 teaspoon oil OR ½ teaspoon ghee and 1 to 2 tablespoons fresh curd or yogurt. 5. just mix everything lightly. add some more curd if the mixture looks dry. don’t over mix or knead. you don’t want gluten to form, so just mixing well is enough. 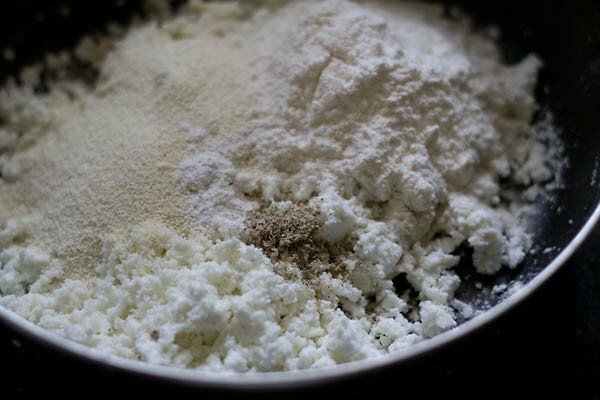 the all-purpose flour is just added to bind the mixture. if gluten forms then the dough balls become dense and won’t absorb any of the sugar syrup and the gulab jamun will not be soft. 6. the mixture will be sticky but smooth. apply some oil on your palms and make small balls from the dough. these gulab jamun balls almost double when frying and also increase when soaked in the sugar syrup. so don’t make large sized balls. there should be no cracks on the dough balls. they should be smooth. 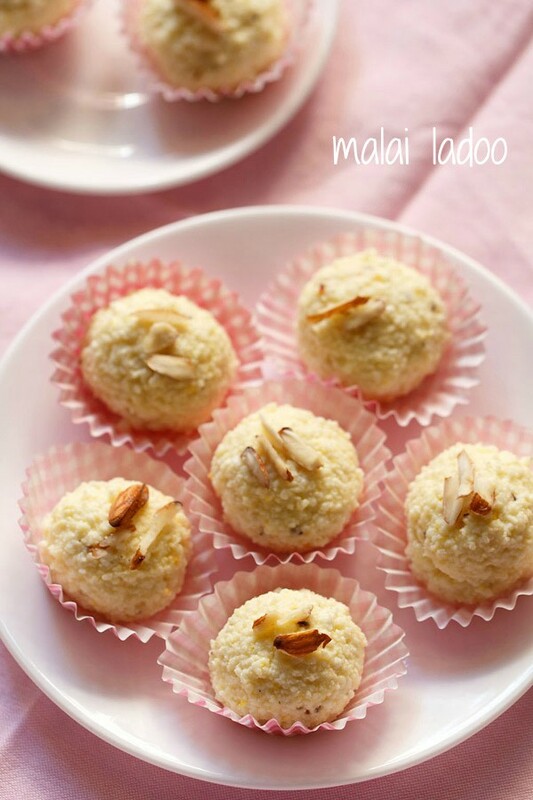 if there are cracks, then just add some 1 or 2 teaspoons of curd or milk to the mixture and continue making the balls. once done, then cover the balls with a kitchen towel. 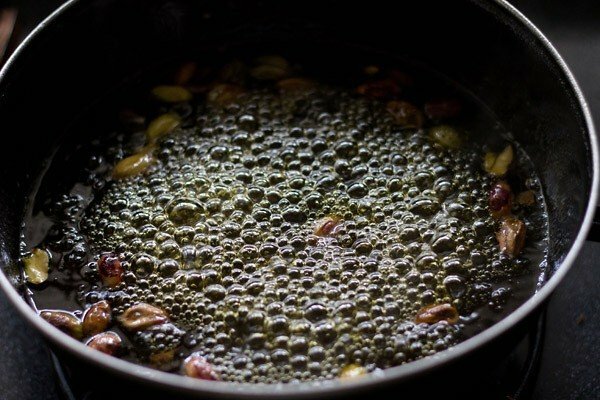 7. heat oil for deep frying in a kadai or a pan. when the oil becomes medium hot, lower the flame. 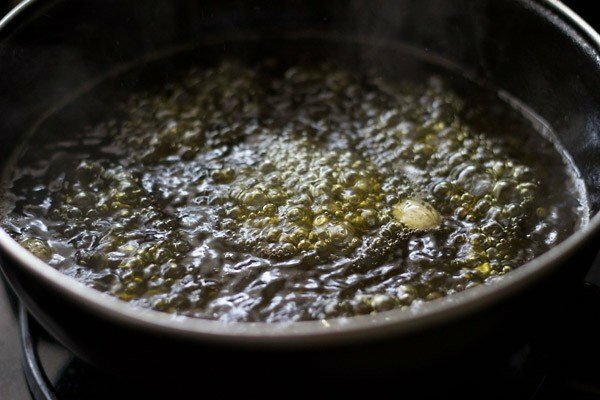 add a small ball in the oil. the ball should slowly rise to the top from the bottom. if it does not rise then, the oil is not hot enough. 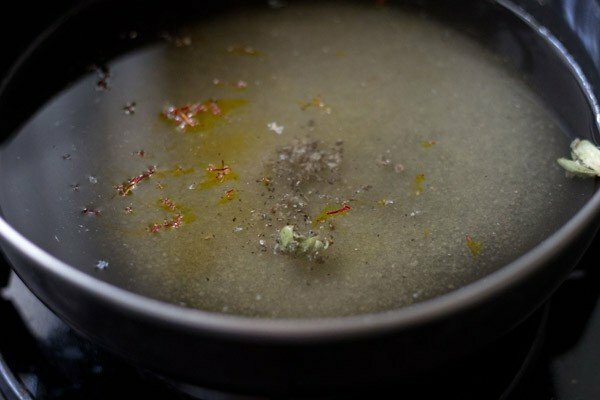 if it rises quickly and browns also quickly, then the oil is too hot to fry. if the small ball does not crack or break while frying, you are alright to proceed further. 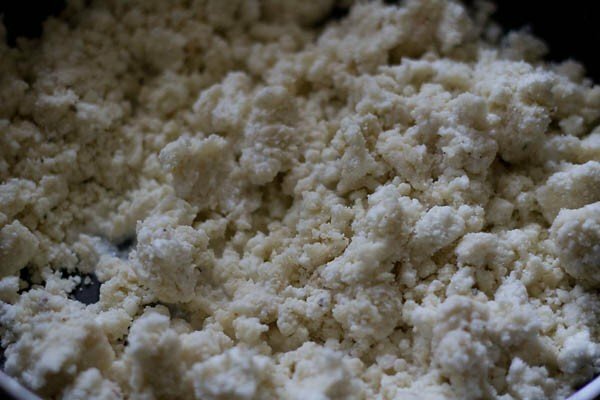 if it cracks, then just add some 1 or 2 teaspoons flour to the dough and form the balls again. in an ideal case, the gulab jamun ball should not crack and should rise slowly to the top and should not get browned quickly. 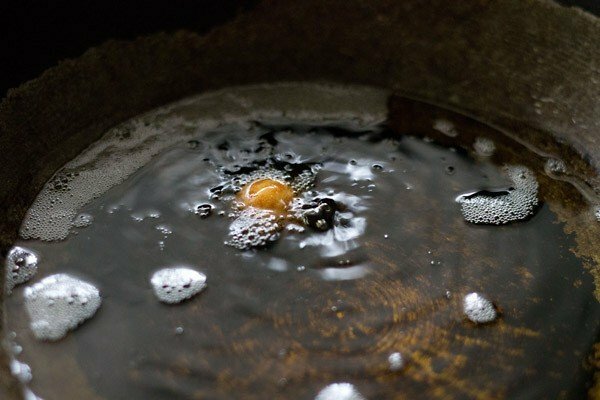 8. when you know the oil is hot enough and on a low flame or medium-low flame, then add 3 to 4 balls or more depending on the capacity of your kadai or pan. 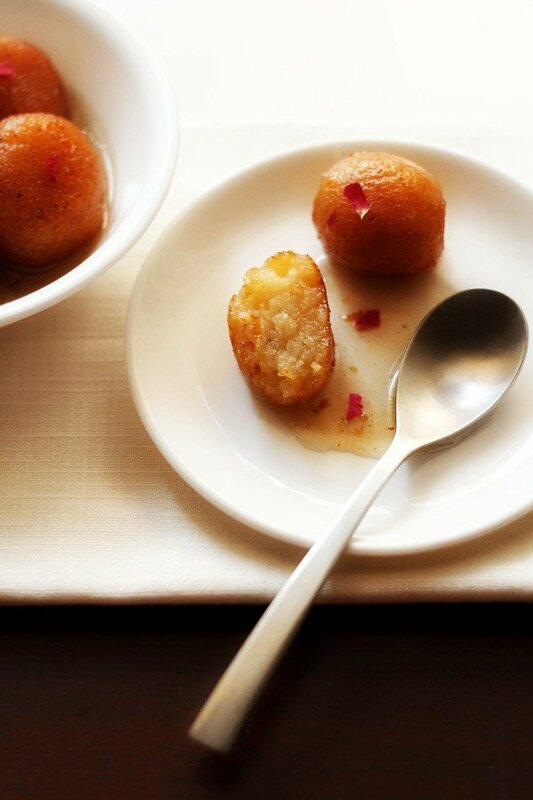 the gulab jamun balls have to be stirred with a slotted spoon frequently to get even browning. if there are handles on the pan, you can just lightly shake the pan so that the balls are evenly fried without using the spoon. but take care as hot oil is there in the pan. the gulab jamun balls should also not become browned too soon. they have to be cooked from the insides too. 9. keep on turning the gulab jamun till they become golden. if the oil becomes cold, then don’t fry the gulab jamun balls. increase the temperature and then fry. otherwise, the gulab jamun would have a hard crisp thick cover when fried in not so hot oil and they won’t absorb the sugar syrup. plus they would absorb a lot of oil too. 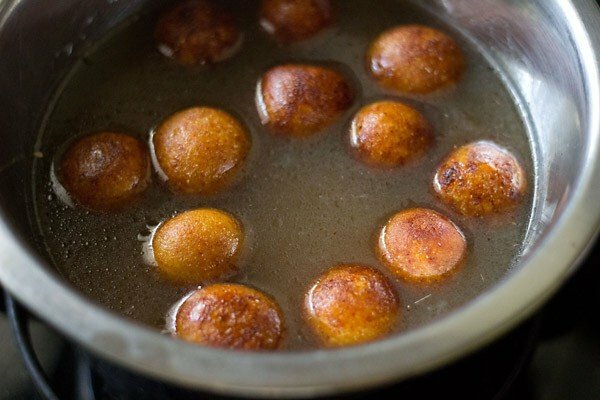 10. when the gulab jamun balls are evenly golden and browned, remove from the slotted spoon and add them directly into the sugar syrup. keep the gulab jamun in the sugar syrup for at least 1 to 2 hours before serving. this is done so that the gulab jamun soaks up the sugar syrup which will make them soft and sweet. that’s why in the mithai shops, the gulab jamun are always soaked in sugar syrup. if you feel the gulab jamun is not soaking in the sugar syrup, then warm the whole gulab jamun for a couple of minutes along with the sugar syrup on stove-top or in the microwave. cover and keep aside. just warm them, don’t heat. 11. gulab jamun can be served warm or cold. 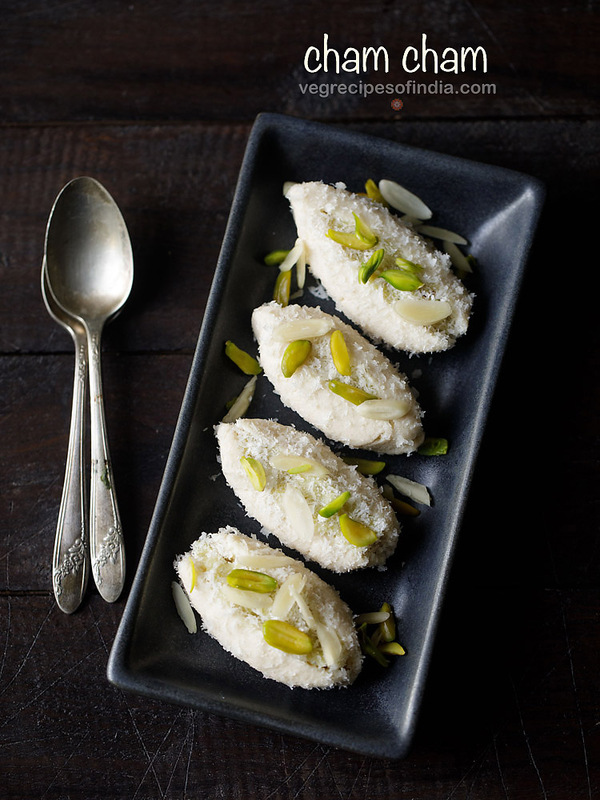 if they are at room temperature, then warm in the microwave and serve the gulab jamun topped with sugar syrup and garnished with pistachios or almond slices. Can I replace the sooji with maida? yes you can skip sooji and add 1 to 2 tablespoons more of maida. I wanted to inquire about doubling the recipe. How would I go about with the amount of flour and Sooji. I did 6 Tablespoons of Maida and 4 Tablespoons of Sooji and ended up with polka dot Gulab Jamuns that resembled strawberries 😃 So I guess 3 Tablespoons of Sooji would be sufficient? Hi Dassana, Your recipes are wonderful and so spot on. I have been meaning to say this on so many posts of yours that I try- but today I am posting this as I have run into an issue and I am hoping you might be able to tell me why. 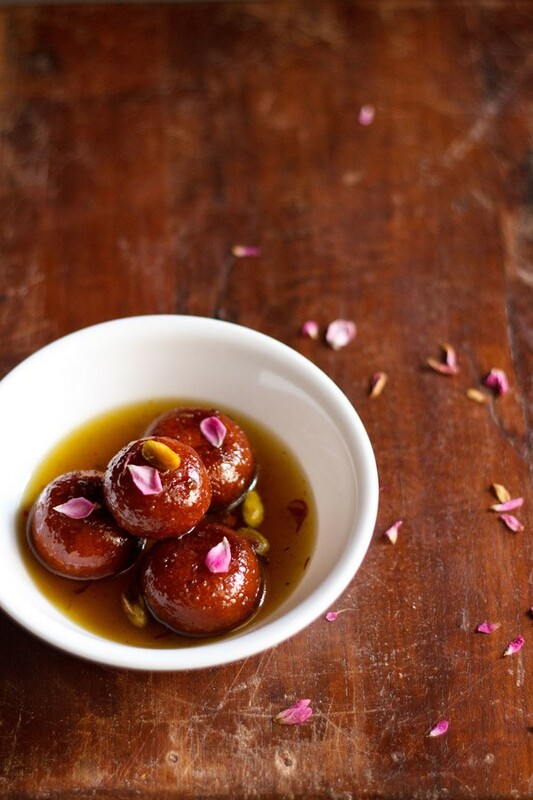 The first time I made your Gulab jamun they were just fabulous. Then the second time ( I bought a different Khoya- this was softer) and made it and all the dumplings when I put them in the sugar syrup went in , in the middle. I had half that Khoya still- saved it up and made it again today and this happened with some and not all. What am I doing wrong- did I put in the dumplings too hot into the sugar syrup? Your recipes are so very good.. thank you for sharing them. thanks meena. 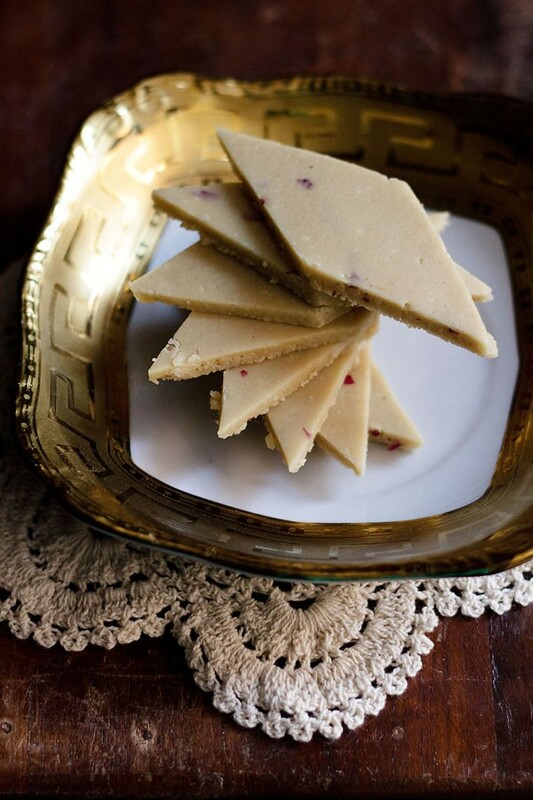 i have also used softer khoya in the recipe. gulab jamuns have to be hot when adding sugar syrup. could be that the sugar syrup was either not a perfect one string consistency or the khoya must be more on softer side. what you can do is do not heat up the sugar syrup once you add them in it. just let them soak in the syrup. hope this helps. I have tried several recipes from your website and others but the measurements that you give are absolutely perfect. Gulab jamuns i used to make had some or the other problem but with your recipe turned great. Thank you for your marvellous recipes. Welcome Amera. Glad to know this. Thanks for your positive review on gulab jamun recipe. I do make gulab jamuns at home and they usually come out well. Your recipe with measurement along with people’s encouraging comments seems too helpful as my method is how I had seen my mom prepare when i was a child. Here i would like to clear a doubt. You said in one of the replies above that Baking soda can be replaced with Baking powder. But is it true? They have a different composition, aren’t they? thanks sona. glad to know. in this recipe both baking soda or baking powder can be used. does not make much of a difference as small amount is used. they do have different compositions but for recipes like gulab jamuns, pakoras, koftas etc, they can be substituted with each other. Hi dasana ,I tried gulab jamun recipe.and it was nice.i would love to try other recipe of your . Thanks Ankita. Nice to know this. Can you give a gluten free version please. Sirisha, i have never tried gluten free version.